The history of the Frankford Creek watershed is sadly typical for urban and suburban streams: a history of gross sewage and industrial pollution; of channelization and culvertization; and of flood plain encroachment. While it may difficult for an observer with a modern "post-Earth Day" environmentalist mindset to understand how such changes were wrought in good conscience, it is important to understand that such "creek-abuse," for lack of a better term, was simply standard practice for the times. Factories located along creeks for the water power they supplied. Even after the advent of steam power for industry in the mid-19th century, many industrial concerns, such as the textile and dyeing houses that proliferated in the watershed, needed the water of the creeks for their processes. Dams were erected, backing up the creeks into long mill ponds. Mill races were dug from the ponds to carry water through the mills, and after the water was used the so-called "tail race" carried it back into the creek. Pity the poor paper maker, who needed clean water for his product, if he happened to be located downstream from a fabric dyeing establishment whose waste made the creek run black, or green, or blue. Disputes over water-rights often ended up in the courts, with the winner sometimes simply the factory that got to the water first. As these factories were located in the flood plain or, in some extreme cases, almost in the creek itself, damage from sudden floods were a common occurrence. The watershed was probably prone to sudden floods even before it was developed, as the upper part of the stream runs in a steep valley, dropping about 400 feet in its run to the Delaware River. But these floods certainly became more frequent, and more sudden, in the 20th century, as the upstream areas began to be built up, the percentage of impervious surfaces greatly increased, and sewers were built that captured the stormwater and carried it quickly to the creeks. Flooding was also exacerbated by the deposition of sewage and industrial wastes, and by numerous narrow, low-slung bridges, which constricted the flow of the creek in flood stage; and by the "tortuous" route of the stream's lower reaches, with its wide meanders typical of a creek in the flatlands of the coastal plain. Use of city creeks for sewage disposal--and, for many of them, ultimately, as the beds of actual sewers--was also standard practice for 19th and 20th century urban engineers. Earlier in the city's history, several creeks had been covered over--"culverted," in the language of the day--simply because they had become so polluted that they posed a perceived health risk to the crowded neighborhoods they flowed through. By the mid-19th century, as epidemic diseases spread and providing proper sewerage and drainage became a subject of great concern, city engineers began planning the culverting of creeks in advance of development. As early as 1853, Philadelphia's City Surveyor, Samuel Kneass, acknowledged that natural watersheds would have to be utilized to provide proper drainage for the city. 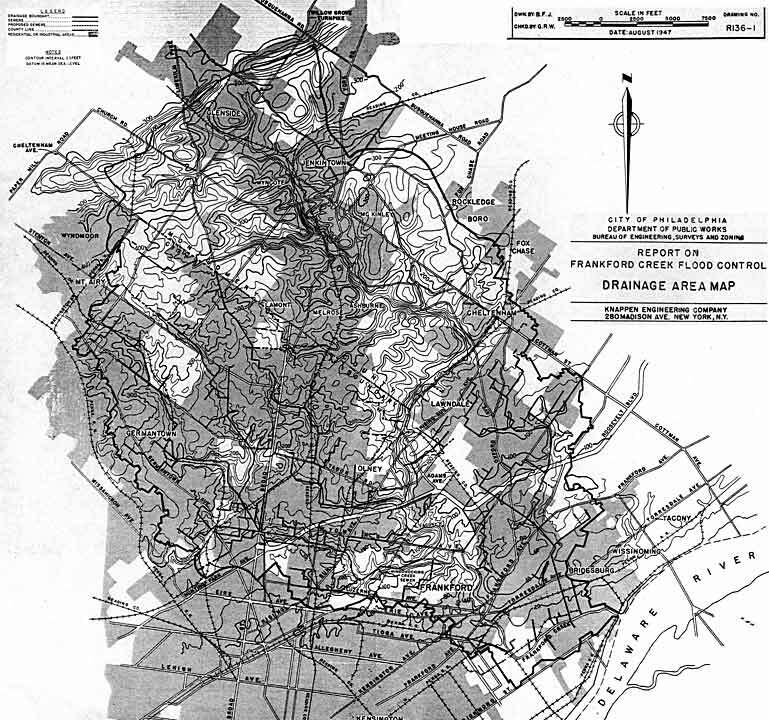 In the 1880s, when the City engineers drew up their preliminary drainage maps for Philadelphia's 129 square miles, converting many of the city's smaller streams into sewers was an integral part of the plan. By doing this work in advance of development, they hoped to solve several problems with a single large project. First, they hoped to avoid the nuisance--to both health and aesthetics--of having a polluted creek flowing through a populated district. They knew these creeks would become polluted once the areas around them were developed, as standard practice was to have branch sewers flow downhill into the nearest stream. Second, they hoped to save money, in a number of ways. Sewage, being mostly liquid, flows most cheaply by gravity. Pumping sewage uphill is expensive (in terms of fuel costs) and (if the pump breaks down) unreliable. Creeks naturally followed the lowest point of the surrounding terrain, and by placing sewers in creek valleys the engineers automatically got the gravity flow they needed. This placement also meant that the cost of excavation was, for the most part, avoided. And once the valleys were filled in--in some areas of the Wingohocking valley, more than 40 feet of fill was used above the pipe--they avoided the cost of building a bridge each time a main street crossed the creek. Finally, building sewers in advance of development meant that the engineers had more freedom in their designs, and since most of the land the sewers were traversing was undeveloped, the cost of paying out land damages would be less. Often, building a sewer in a creek bed was to the advantage of private property owners, especially in areas of the City where the grid system prevailed. A piece of land with a creek cutting through it was difficult to subdivide into regular slices. With the creek in a sewer, and the rectangular grid laid over the valley, real estate speculators could divide their property into the tightly-fitted rectangular lots so common throughout Philadelphia. Since the streets were built and graded on top of the sewers, and often water and gas lines were put in as well, the developers had a ready-made infrastructure that tended to speed up the sales of their lots. The City, in return, could count on a quick return on its investment in infrastructure from the resulting increase in tax revenues from the new buildings. But something is missing from the above picture: Sewage treatment. 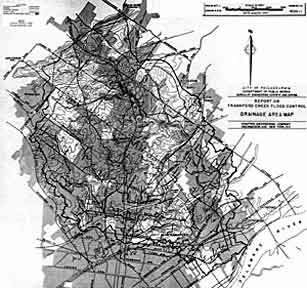 All of the sewers built in creeks simply emptied into larger streams, which eventually emptied into either the Delaware or Schuylkill rivers. This lack of sewage treatment was not because of lack of knowledge, but more a matter of lack of money, or the political will to spend the huge amount that would have been needed to accomplish it. As early as 1866 Strickland Kneass, the City's Chief Engineer & Surveyor (and a younger brother of the aforementioned Samuel H. Kneass), wrote in his annual report that dumping of raw sewage could not continue indefinitely, and that some method of purification would have to eventually be implemented. An interceptor sewer was built in the Schuylkill Watershed above the Fairmount Water Works in the late 1800s, collecting the sewage that would have flowed into the water supply from Manayunk and other northwestern city areas. But this sewage was not treated: instead, it was simply dumped into the Schuylkill below the Fairmount Dam. The State forced the City's hand in 1905 with the passage of a law protecting the waters of the Commonwealth from pollution. The City worked for the next nine years, researching various methods of sewage treatment, and published its Report on the Collection and Treatment of the Sewage of the City of Philadelphia in 1914. Work on the system of collectors and the first treatment plant, in Northeast Philadelphia near the mouth of Frankford Creek, had just begun when the U.S. entered World War I and all labor and material were diverted into the war effort. The Northeast Plant opened in 1923, treating about 25 million gallons per day from an interceptor that kept the flow of the Wingohocking out of Frankford Creek. Various interceptor extensions in the Tacony Frankford watershed were undertaken throughout the 1920s, but the onset of the Great Depression put an end to most public works for most of the 1930s. From the Depression, the City and country went straight into war production. With the U.S. entry into World War II in 1941, labor and material were again strictly regulated, and little work on the sewerage infrastructure was accomplished during the war years. By then the lower Schuylkill had become nothing more than an open cesspool which, if the wind was right (or wrong), could be smelled at City Hall. The water in the Delaware, a major port during the war, was so rife with hydrogen sulfide gas that it sickened seasoned sailors, discolored the paint on ships, and corroded any metal along the waterfront--buildings, the brass on ships, even silver coins in a longshoreman's pocket. Several times during World War II, the City applied for Federal aid to complete the sewage treatment project and to aid with flood control in the Tacony-Frankford watershed, but to no avail. A charge for use of the sewers, called a sewer rent, was twice struck down as unconstitutional before finally being declared valid by the State Supreme Court in 1945. The income from this rent allowed the City to borrow the needed money to finally complete the long-delayed sewage disposal and flood control projects. The Northeast Plant was completely revamped, and the Southeast and Southwest Plants quickly followed, all of them opened in the early 1950s. The completion of the collector, or interceptor sewers, took another dozen years to complete, with the last link in place by 1966. In the post-war years, the City finally dealt with the problem of flooding along Frankford Creek. Following the recommendations in a 1947 report from Knappen Engineering Co., the creek was diverted into a concrete channel south of Juniata Park, where a cut off was made across a constricting oxbow. The creek was covered over in one stretch near Leiper Street. In the final phase, completed in 1956, the flow was diverted into a channel that went straight to the Delaware, bypassing the long bend in the natural course that had carried the creek through Bridesburg and past the Frankford Arsenal. In part of the original creek bed a new sewer was built, and then most of the channel above Bridge Street was filled in. Considering the history of creeks and sewers in Philadelphia, this was a most fitting ending.